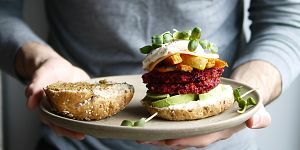 Are veggie burgers like cauliflower buffalo wings in the sense that…what we really love about them is their sauce and fixings? …the blue cheese dip, the Frank’s Red Hot, the mayo, the grainy mustard. The list could go on. This is precisely why veggie burgers are a great option any day of the week. They satisfy fully…and they’re the eco-friendly, healthy and humane alternative to meat burgers. 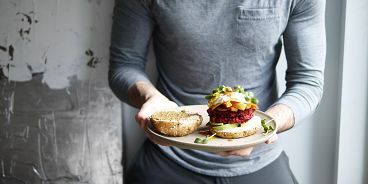 Try this Beet Burger recipe from Ana of The Awesome Green. I thought the mixture seemed a bit runny at first, but once your patties bake, they firm up and turn out well. When it comes to burgers of any kind, you can’t get too messy. My favourite toppings and condiments include grainy mustard, vegenaise, Daiya cheddar cheese, lots of avocado, a runny poached egg, yam fries (roasted yam wedges tossed in lots of olive oil) and greens (I used pea shoots but cilantro, parsley or lettuce, of course, works too).